Reliable Victor Reinz® sealing solutions include both cylinder-head cover modules and oil pan modules. Depending on the application, the system can include the cover, the gasket, or the fasteners. Our engineers work directly with commercial-vehicle OEMs to develop high-quality products that meet specific engine requirements. Bolstered by our regional research and development centers, we deliver custom sealing solutions that meet exact customer needs. With expertise in more than 35 applications, we design and manufacture cover modules for gasoline or diesel engines – addressing key considerations, such as emissions, weight, durability, and cost. Because we design the sealing system as a part of the cover design, this robust module functions as one precise unit. This also helps to increase efficiency. Dana constantly seeks new ways to reduce weight under the hood. 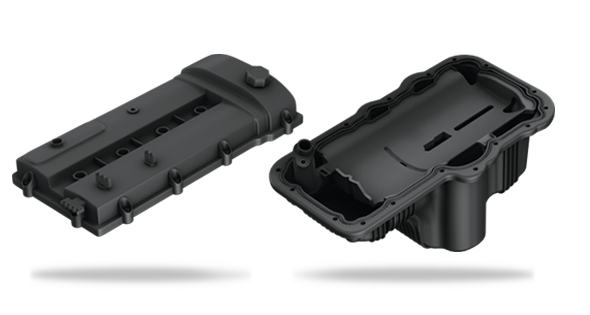 Compared to a traditional stamped pan with related oil-handling components, our advanced thermoplastic oil pan module offers considerable reductions in weight and cost.